"A common misconception among pet owners is that dogs are colorblind. In reality, dogs have dichromatic vision and can see most of the range of colors humans can see. Though they can’t distinguish colors in the 510 to 590 nanometers, or wavelengths, range—between green to orange. Other key functions in canine vision include seeing better in low light than humans can, and being able to see into the ultraviolet UVB spectrum. " Feline color perception is different than dogs but does have similar characteristics. Cat's vision is trichromatic, but they can’t see colors with as much precision as humans do. They also discern the blue and violet end of the spectrum better than the red end." Any methods of preventing stress only serve to benefit both client and patient - especially since pets feeling anxious may hide the symptoms that prompted the vet visit, and may even alter their test results. So as we troubleshoot some calming colors on our clinic walls - what do you wish your veterinarian did to reduce stress for your pet's visit? Managing the environment is not the same as modifying the behavior, but we hope that each small change helps to make a positive change in how your pet views the vet. With de-construction done, now the fun begins! To make sure the plans meet everyone's needs, our staff has used Google Sketch Up to create walk-throughs of the proposed changes. It may be nerdy, but any Veterinary Technician can attest to the importance of things like wall outlets galore, ample counterspace, and plenty of clearance around treatment tables. ​So, if both rooms have the same needs for central oxygen, anesthesia equipment, monitoring equipment, heat support and instruments, then why are two separate rooms needed? The answer - fomites. Although not required, it is ideal that dentals are performed in a designated space away from the general treatment area. This prevents particulate from scaling and polishing from circulating around in the air. A seemingly little thing, makes a big difference! Two seperate, designated rooms = maximized sterility, safer complex and orthopedic surgical procedures, and lower rate of infections. With renovations underway, it certainly makes us appreciate how the design of a building directly impacts the flow of a practice! An interesting factor of converting a human hospital to a veterinary clinic is the management of sound. 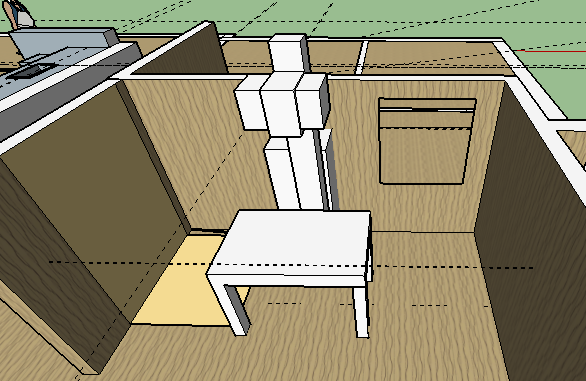 In a human office, exam rooms flank the building, creating a central treatment location for doctors and nurses. In a veterinary hospital, the format is linear. 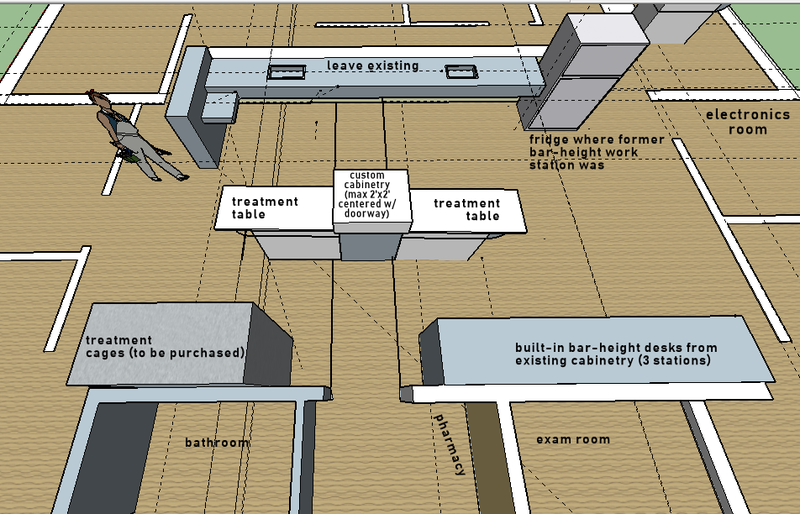 Exam rooms close to the front, hospitalization and procedure rooms in the rear (explaining why 'the back' is a widely used euphamism for walking a patient to a treatment area.) This, along with sound-proofed walls and doors, keep the squeals that often accompany a piglet's first vaccines from startling the elderly cat in Exam Room 1. Veterinary clinics that treat exotic patients in addition to dogs and cats face unique renovation challenges. A soundproof room for the hospitalization of rabbits, who can easily injure themselves when frightened, is mandatory. Species of birds from different continents may require rooms with different air exchanges due to allergies or communicable disease. The hospitalization of reptiles requires the ability to modify temperature and humidity, and provide full-spectrum lighting. Mammals are no exception - herbivores should not be hospitalized in treatment cages previously occupied by carnivores, as the scent may heighten their stress level. Even the ceiling is a factor - tiles must be adequately secured to prevent an agile primate or flighted bird from finding their way into the rafters! In our new facility, we hope to be able to meet the needs of every species we treat. As an owner, are there features at a vet clinic that are important to you? What does your pet seem to like or least like about their vet visit? Dr. Draper, Dr. Benson, as well as our managers from tech and reception toured the facility together multiple times to walk out our blueprints in 'real time.' It was important that our new hospital catered to the needs of all of our staff, so we could serve our patients in the most efficient way possible. The renovations to convert this space from a human hospital into one more tailored to the needs of furry and feathered patients will take less than 3 months! ​After lots of searching, Dr. Draper has found Cornerstone's new home- and we can't wait! 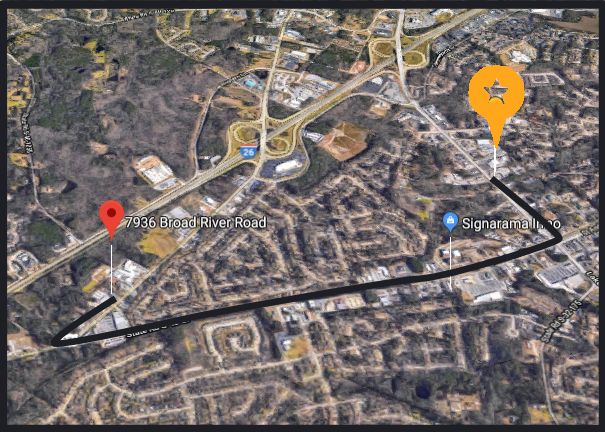 Our official address is 7936 Broad River Road - one mile from the I-26 Broad River Road exit 101, across from Sandhills Pediatrics and next to St. Peter Baptist Church and Dutch Fork Elementary School. Although renovations are soon to come, the hospital's open, airy, sunny layout with plenty of room to grow is a perfect fit. Follow our building and renovation journey to provide our same quality care in a new state-of-the-art facility.